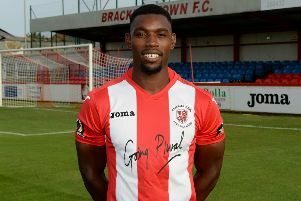 Brackley Town manager Kevin Wilkin said it felt like a hole had swallowed his side up in Saturday’s 4-1 defeat by Alfreton Town. The victory took improving Alfreton up to 11th place in Vanarama National League North with a run of three wins and a draw from four games but leaves Saints winless in six and still in the bottom three. Saints took a deserved lead into the break through Steve Diggin but after the restart goals from Sam Jones and captain Dan Bradley turned it around. Captain Ryan Austin was sent off for a challenge on Bradley before Ryan Wilson and an own goal from Pablo Mills confirmed Saints’ fate. The Saints boss said: “We had loads of endeavour but it is about managing games and poor decision-making. “We bossed the first half and should have been two up with the chances we had. They started the second half strongly and we needed to see out that opening spell.